So here are my January pages! I’ve been really drawn to black and white lately, and I always like to keep my title pages relatively simple (and full of stripes, of course). I am using a printable calendar from Harley Quinn & Co for monthly calendar title pages, printed 5×7. I’m also including my weekly photos of Ben in my spreads, and it’s really nice to know I have a really good, non-iPhone photo of him to include each week. 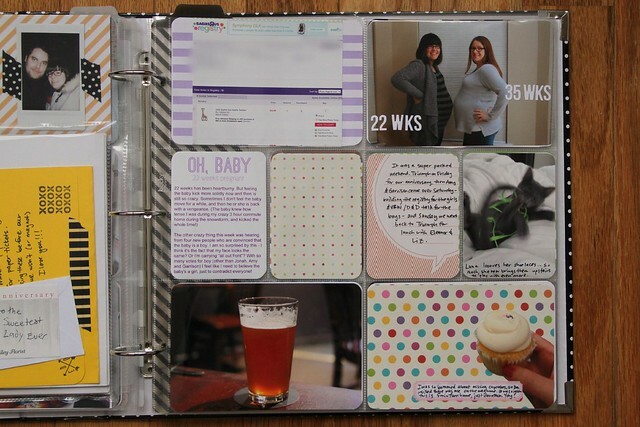 These pages included some major milestones for Ben (which I’m also documenting in his baby album, but they were so noteworthy I had to include them here, too), as well as our two year wedding anniversary. I hesitated to include a photo from two years ago in this year’s album, but the photo makes me so happy that I had to include it. 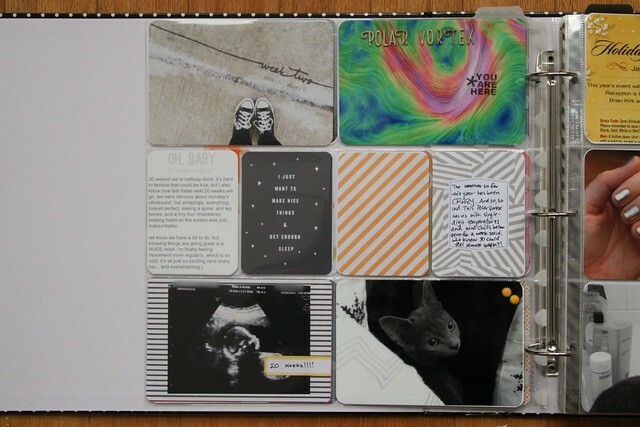 I keep finding myself drawn to gray and black and white when it comes to journal cards and filler cards this year, so this was my attempt to make a concerted effort to include color. 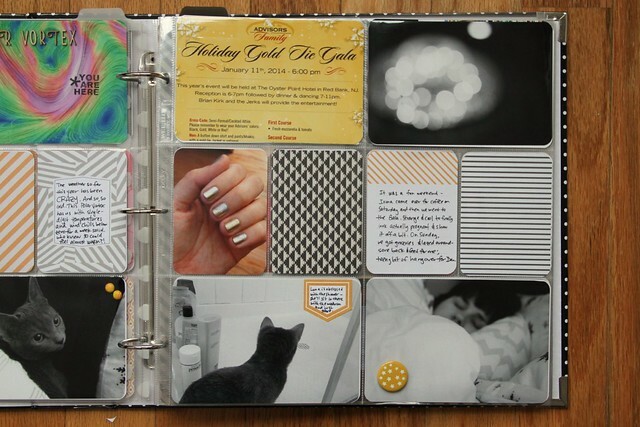 I sorted all of my cards by color right after the new year, thinking it would make it easier to find cards that coordinate with the photos on my pages, but I keep reaching for black and white cards. I’m wondering if it’s a winter thing, or if it’s more of a style evolution. 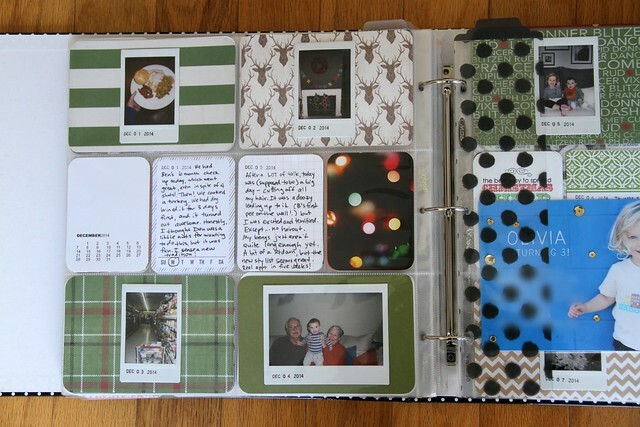 This week was also a great example of just using the best photos – last year I would have used an insert for those beach photos, or just included one, and it was so fun (and liberating!) to be able to include all of them. And this turned out to be one of my favorite spreads of the month. All of the photos of Ben on the left side are from one afternoon the day after he learned to crawl, and most are screenshots of a video I took. (And therefore all blurry and grainy, so black and white was absolutely the way to go!) He has been SO busy and all of my photos of him are blurry these days, and I like that these photos reflect that. So that’s it! I’m hoping to be able to get my February photos ordered today, because I can’t wait to keep working on this. 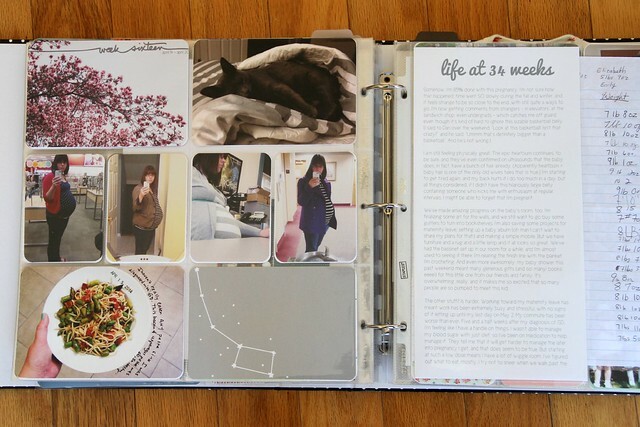 When I came back here a few weeks ago to see how far I got when it came to posting my Project Life 2014 pages, I was really surprised to realize that I only ever posted my January pages. And then I remembered that while I stayed current until the beginning of February, I didn’t make a single page from early February until I began my maternity leave in May. I got myself all caught up, and then didn’t touch it again until Ben was two months old… and that pattern continued until December. December was amazing, because the instant photos meant I could stay caught up, which felt SO GOOD after being epicly behind all year long. I’m determined to keep this momentum with 2015, but we’ll see how that goes. 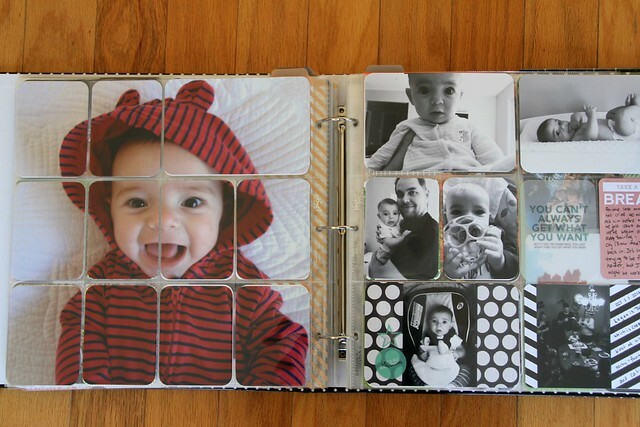 I’m switching to 9×12 albums, but they aren’t available yet. Ah well. Anyway! Here are some of my favorite pages from 2014! 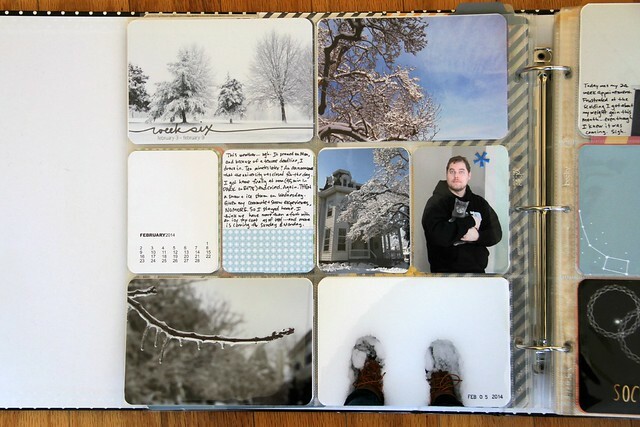 Many of my winter pages look like this, all snow and ice and blue. 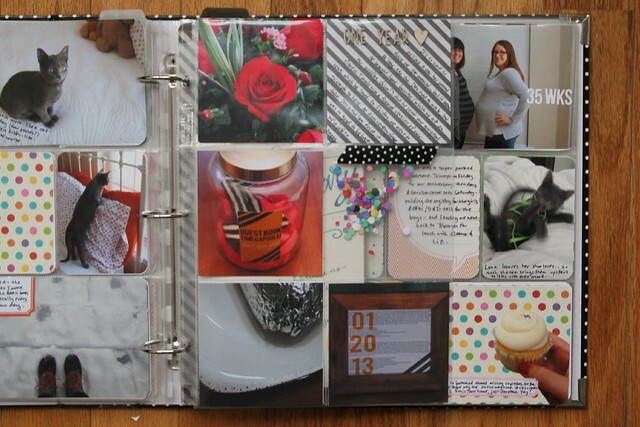 Here, I was documenting my maternity outfits each day, figuring I’d want to remember that some day. I also included this blog post, and the paper with my extended family’s guesses for Ben’s arrival and size. 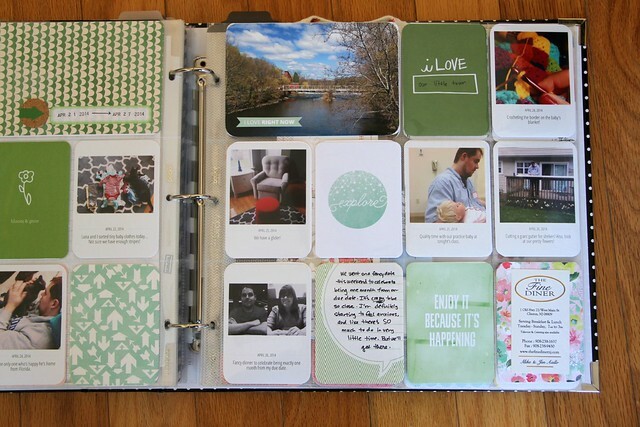 I don’t use a lot of green, but in 2015 in general, I was really trying to stick to color schemes with each spread. 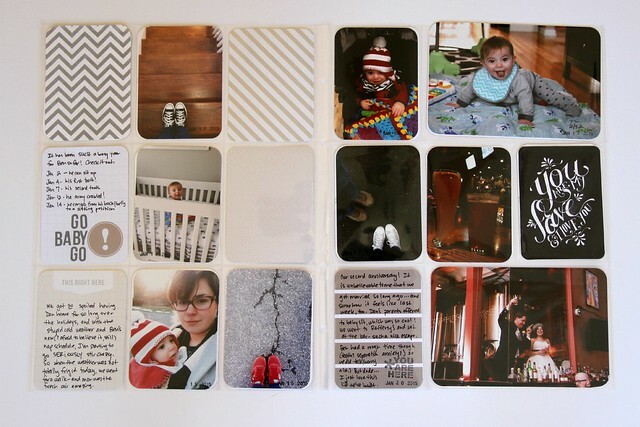 This is also a good example of the method that made it so possible to catch up – I made these 3×4 cards with the Collect app on my phone, and then uploaded them directly to Persnickety Prints. In 2014, I finally started ordering 3×4 prints, rather than printing two on 4×6 paper; not having to trim them really saves so much time. 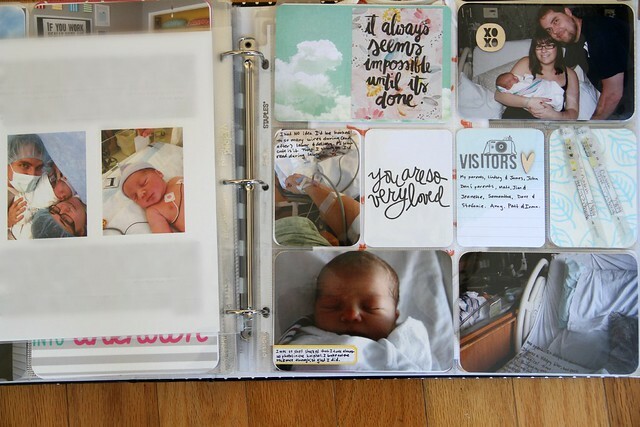 I had to share this page, because I stared at that left side for months; I made that page just before Ben was born, and then my album was open to that page until I caught up again. 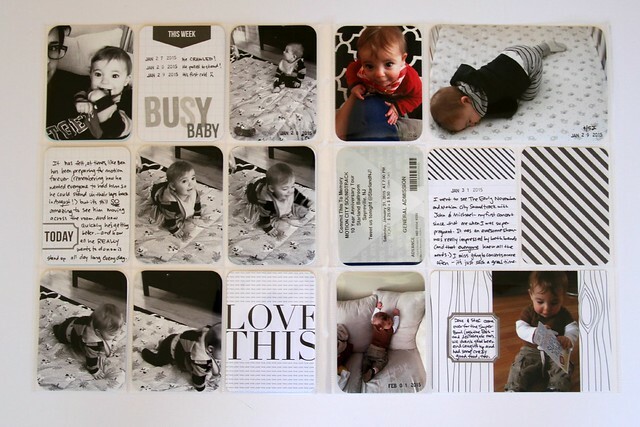 I included some 8×10 inserts, with one of our first photos of Ben, which is one of my absolute favorites still. 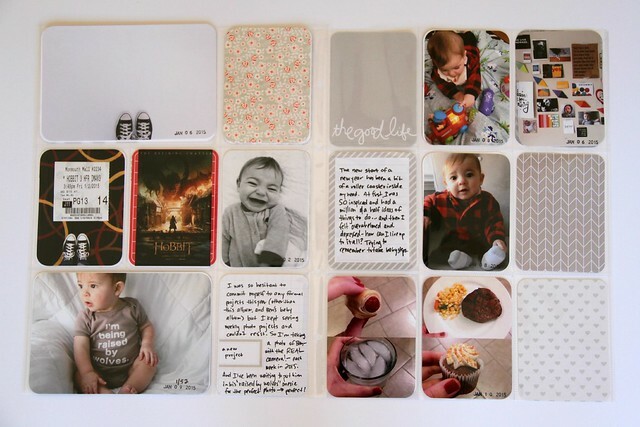 This is the rest of Ben’s birth day spread; on the left you can see the 8×10 inserts, which include a really detailed version of his birth story, and some photos Dan took in the hospital. The right side has our bracelets, a quote I found on Pinterest while I was in labor that was SO perfect, and some photos I took in the hospital. 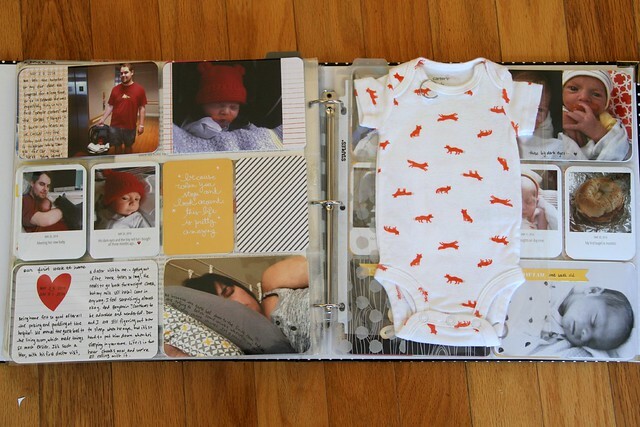 This spread also includes some cards from the Collect app, plus one of Benjamin’s teeny tiny newborn-sized onesies (this one was my absolute favorite, so it’s fitting that it has a place of honor here). 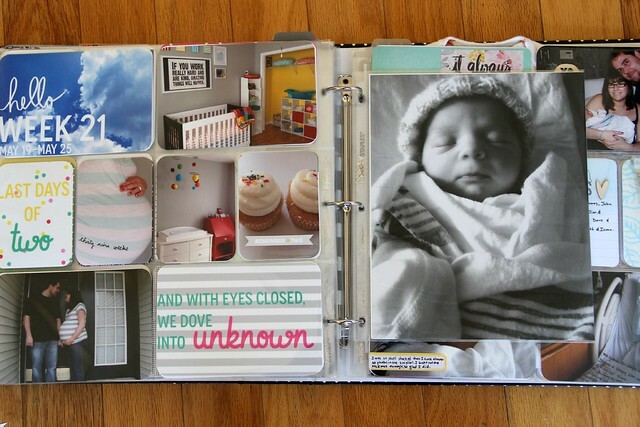 I’m fairly sure I saw this in Elise‘s Project Life album when her daughter was born, and it stuck in my head because it really reminds me just how tiny he was. On the left here is one of my VERY favorite photos of Ben; it was just begging to be printed full size. (And printing full page photos is absolutely a secret trick to catching up when you’re super behind.) On the right are a bunch of photos from one day with Ben; I had been planning to do a day in the life but I never got around to writing out what we did. 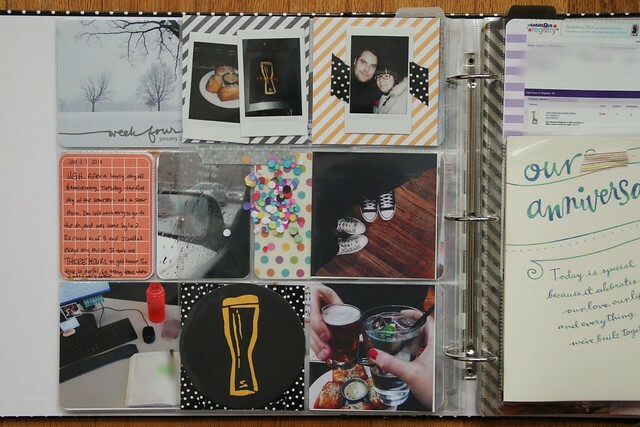 This is my first page from December; you can see how I incorporated the daily instant photos, plus some cards writing out what we did each day. I love the color scheme here; I had a 6×6 paper pad with holiday paper, and it made it really easy to make things look cohesive. 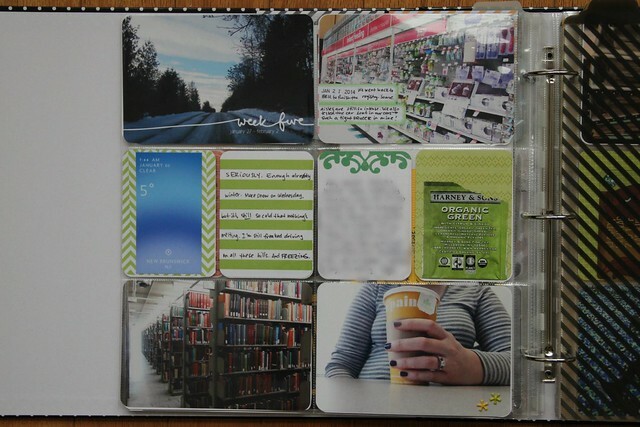 On the right, I used a 2×2 coin protector page to include a Day in the Life. Dan and I both did Day in the Life in March, and I’ve been wanting to do another now that Ben is here and we’re in the thick of it. It was a regular day at home together, and I took photos and wrote the journaling as the day went on, which was really fun. So that’s it! I’m really glad I started Project Life a few years ago; it’s such a wonderful creative outlet, and knowing my photos have a home and aren’t just lingering on a hard drive somewhere is SO gratifying. 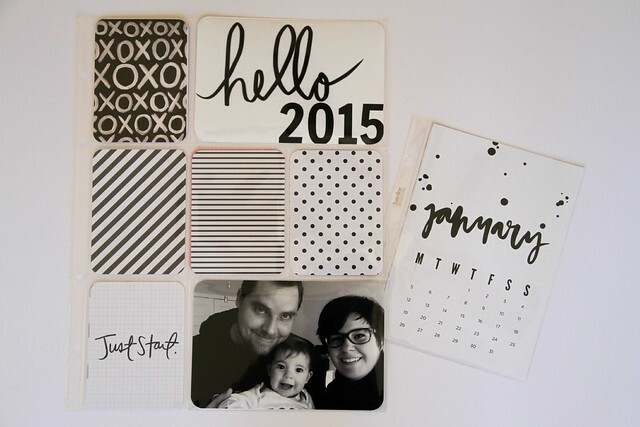 I’m so excited to keep going with this project in 2015! A funny thing has been happening recently… I’m feeling simultaneously eager to create and burnt out by everything I’m doing. I’ve long had a bad habit of being unable to let myself out of my own commitments to creative projects, and I’m in a bad cycle now. I feel like I’m half assing everything. 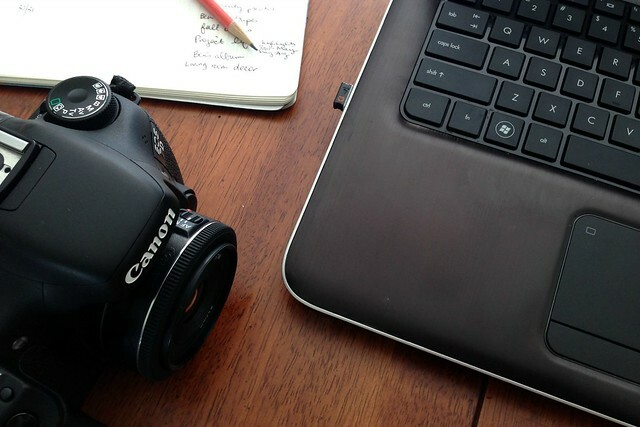 Right now, I’m still slogging through my daily photos, trying to write here more, planning Project Life pages, printing photos for Ben’s baby album and updating a private blog for family with photos of Ben. I’m taking photos all the time, but I’m not happy with many of them. And then I’m using those half-assed photos over and over and over again – on instagram, in Project 365, on Ben’s blog, here, and in Project Life. I’m keeping up with it all, barely, but I’m not happy with much of it. I want to make time to take “real” photos again. 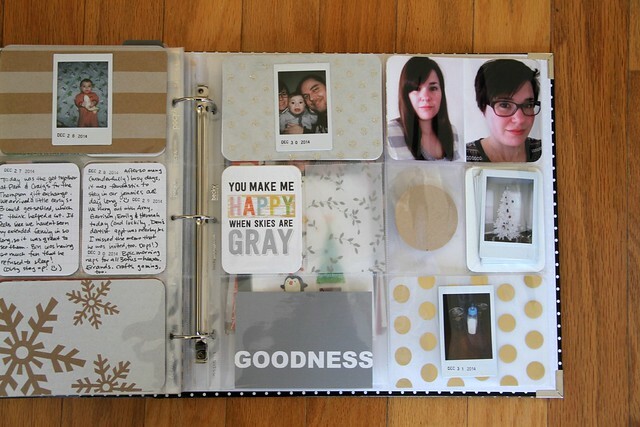 I want to sit in my craft room and actually make some scrapbook pages with all these photos I’ve been printing. 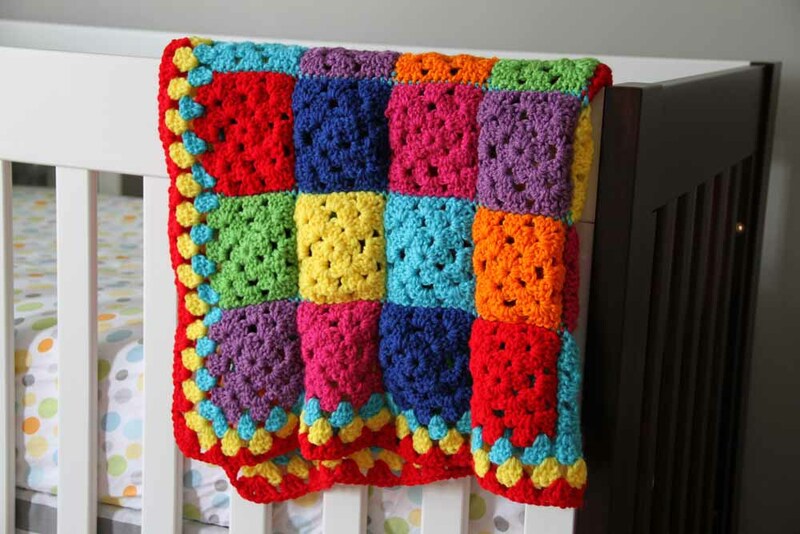 I want to finish crocheting the blanket I’ve been making for our newest nephew. I want to try NEW things. I want to make stuff to decorate our house. Oh, and I don’t ACTUALLY want to abandon any of these creative endeavors, either. I’m frustrated and I don’t know how to climb out of this rut. Obviously, I’m attempting to do too much (or feeling obligated to keep up with too much, for no reason other than that I started these projects and it makes me twitchy to think about abandoning them). I know that a lot of this frustration comes from the fact that any of this creating happens in ten minute bursts during Ben’s naps, or when he’s happily kicking in his bouncy seat next to me. Finding time for the “fun stuff” is still so hard, because there’s always laundry and dishes and bottles to make or clean when I have some time because Ben’s either sleeping or happy to chill for a bit. I don’t often allow for the fact that I’m still so new to all of this… still trying to fit the old Elizabeth in with this new one. I know that a lot of this comes back to needing to define myself in this new role. Somehow, my brain is like “well you’re home so much now, there should be lots of time to do some crafts here and there!”. Except taking care of a little baby is a full time job, too. I wouldn’t expect to be fitting in crafts in the afternoon if I was still working in an office. So there’s obviously some sort of mental adjustment that needs to be made. And sure, I could use time in the evenings to do some of these things, but when Ben’s finally asleep, I want to flop on the couch (with a beer or two or three) and hang out with Dan. I’m not writing this because I want someone to tell me that my photos are still good, or anything like that. Mostly I’m just not sure how to figure this out. I debate giving up Project 365 fairly often, but I’ve got less than 100 days to go, and I’m taking photos all the time anyway. 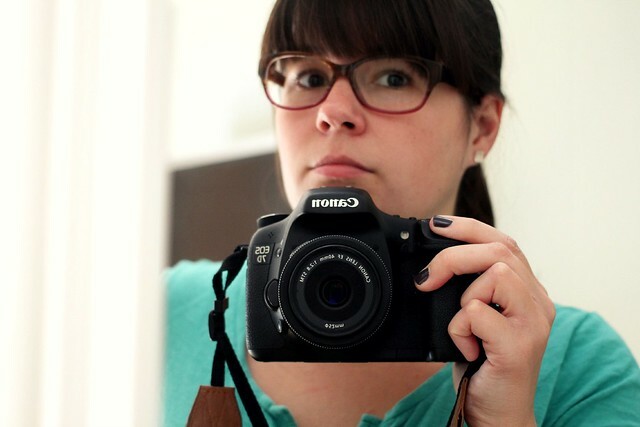 I waffle about giving up blogging (while also wanting to recommit to it). Ben’s sleeping and I’m typing when I could be putting Project Life pages together or making that fall wreath or editing photos or or or. I don’t know what the answer is. Am I looking for someone to give me permission to abandon some of these projects? Do I just need to give all of this a little more time, and be a little easier on myself? Would a weekend afternoon in the craft room while Ben hangs out with Dan help? Will it take me three days’ worth of naps to even finish writing this post? Your guess is as good as mine. Since I left my job in May, I have been spending more time actually IN our house since we moved in a little over a year ago. 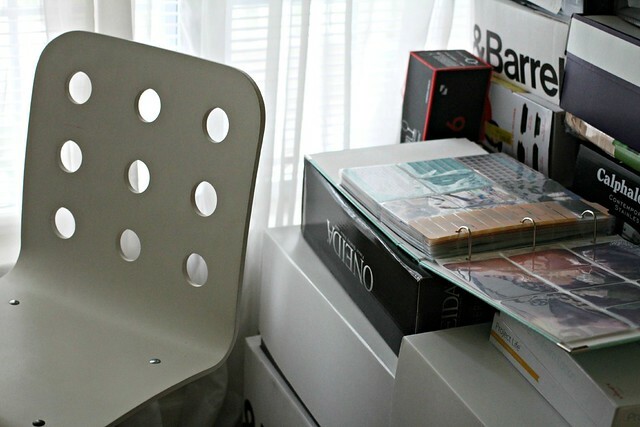 Some of the rooms frustrate me, because all I see are un-decorated walls or the piles of crap in the corners. But Ben’s room is the happiest room in the house, and not just because it’s the only room I’d say was actually finished. I wrote about the before way back in February when I was pregnant, and we had just started painting. 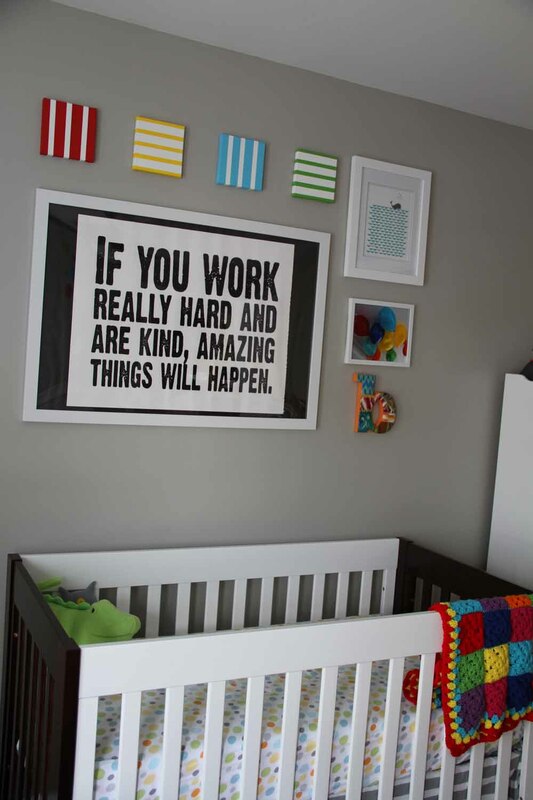 From the very start, I had very clear ideas about what I wanted the baby’s room to look like, boy or girl. Gray walls, white furniture, pops of bright, bold colors. It took time to collect and make and decide on all of the various pieces, but oh! am I happy with how it turned out. And even better? 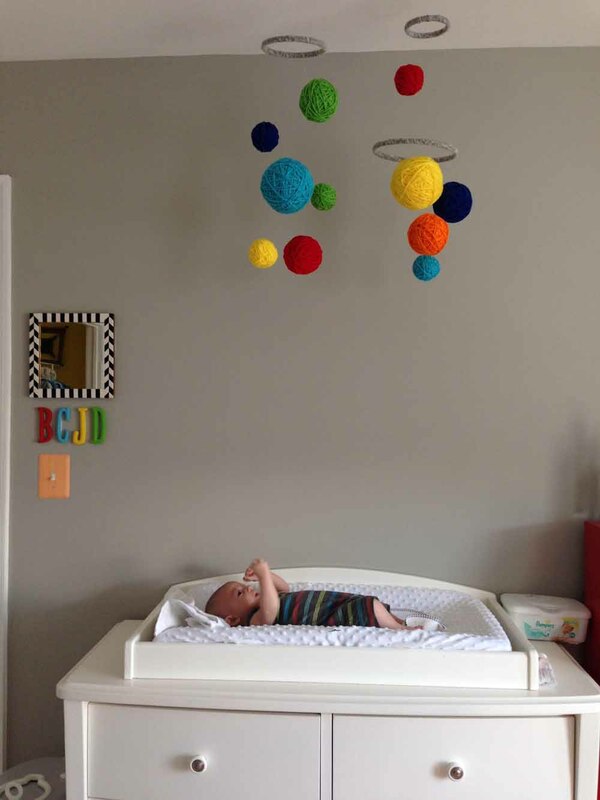 As Ben grows, I can tell he’s noticing things like the bold art and bright mobile (and, okay, I have to also say that the freaking ceiling fan is his favorite thing EVER) and that makes me so happy. 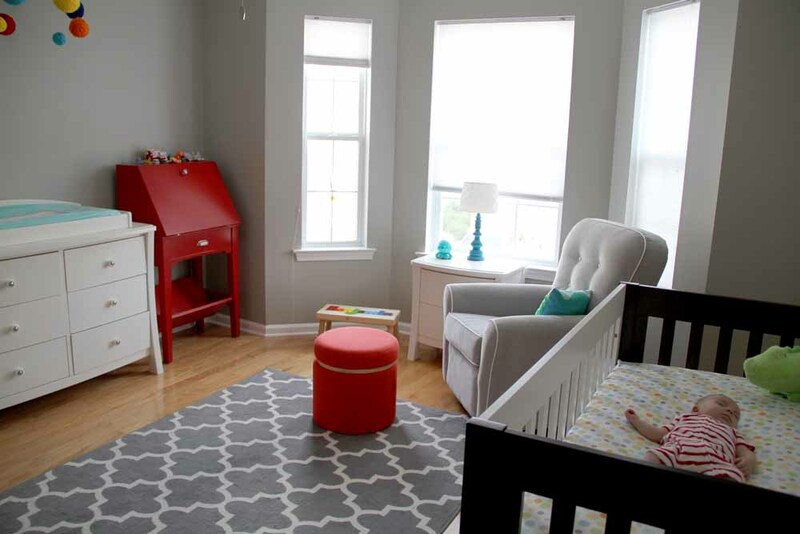 Ben’s room gets great light, which helps the bright colors really stand out. 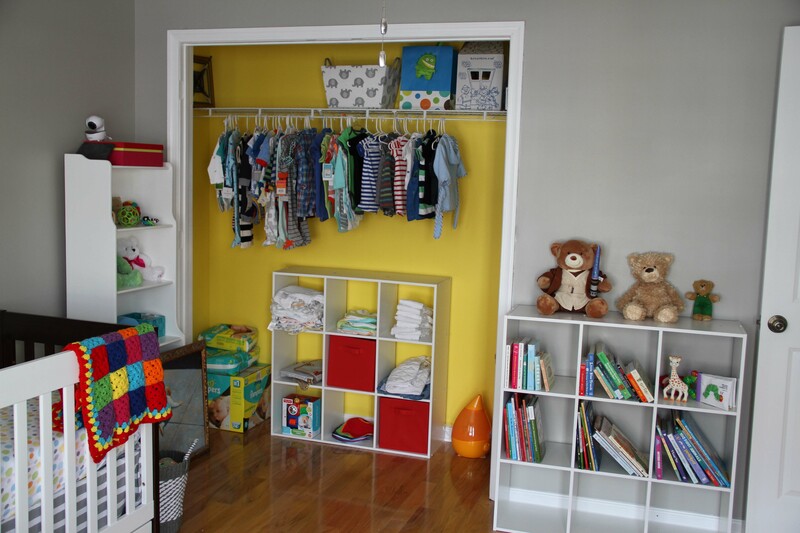 We started with gray paint, white trim, and a bright yellow closet. 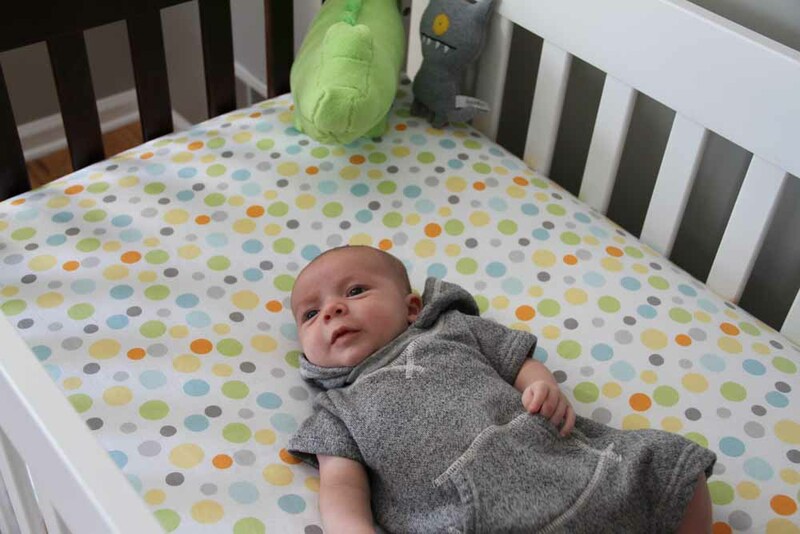 The crib was the first thing we had in the room (other than the beloved red desk), and I like how simple it is. (I made the crib skirt out of pillowcases.) We ended up finding the dresser and night table at Target of all places, and they are made of actual wood (which is a lot harder to find – at an affordable price – than you’d think). We’re really hoping they last a long time. The glider is a bonus because it looks modern and cool but Dan and I BOTH think it’s comfortable. That orange ottoman was a last minute addition once the glider’s matching ottoman was out of stock, and I like the extra color it adds. My mom painted that tall bookcase white, and I can already tell we’ll appreciate having some extra storage. (Ben doesn’t even know toys exist yet, and they’re accumulating pretty quickly.) I spent a LOT of time trying to find the perfect rug… and this one is exactly what I wanted. (We’ve since bought two more in other colors/sizes for other rooms in our house-and so has my sister, because the price is insane for such a nice-looking, SOFT rug). I made the mobile using this tutorial, which I found on Pinterest. Hanging that mobile was by far the most difficult and frustrating part of this entire project, holy hell. It’ll be a looooong time before I attempt a project with fishing line again, and even longer before I’ll be able to convince Dan to help. But it looks great, and Ben loves it, which is so awesome. One of my favorite aspects of Ben’s room is the closet. We took the doors off and painted the inside of the closet bright yellow. (I was really nervous at first that the shade we picked was WAY TOO INSANELY yellow… but in daylight it is just right.) I think the lack of doors and the yellow make the room feel a lot bigger. The two little Expedit-like bookshelves are meant to be closet organizers, which meant they were cheap (and it’ll be easy to buy new canvas boxes to hide stuff away if we want to do that). For a long time, I was trying to convince Dan that we should hang a second rod for hanging clothes. I don’t know if it’s because we had a boy (maybe girls need more hanging storage for all their tiny dresses?) but that hasn’t seemed important since we’ve been using the room. I think I spent the most mental energy on the art wall, if I’m being honest. 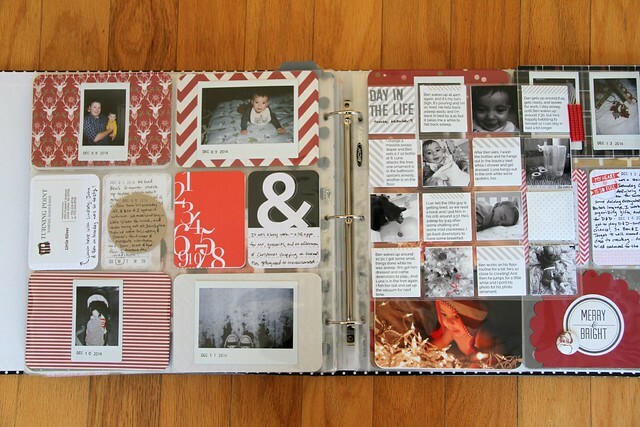 Countless hours on Pinterest bookmarking artwork, DIYs, gallery walls in other rooms. And I’m SO happy with how it turned out. The big poster print is a Conan O’Brien quote that I matted with bulletin board paper. I painted the four little canvases using washi tape and blue painter’s tape to achieve stripes (what else, I mean, really?). The balloon photo is one I took for a daily photo a few years ago, the letter b is from Anthropologie, and the whale print is from an etsy shop that I think has since closed. I like how the little square mirror echoes the black and white of the big poster, and Ben’s initials are painted in the same colors as the little canvases. 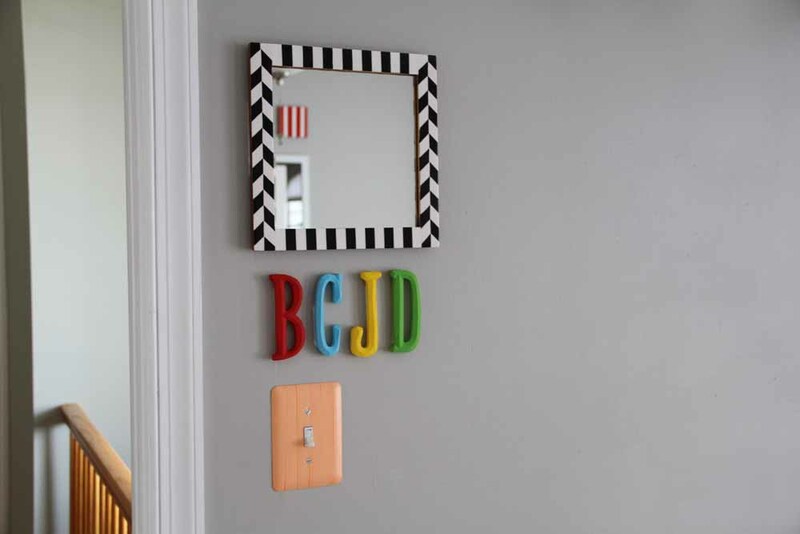 I also covered his light switch cover in washi tape, because another little pop of color can never hurt. And in a way, the whole thing started with this blanket, which I began crocheting a month or so after I found out I was pregnant. I knew all along that I’d make my baby a blanket (it’s what I had in mind when I added “crochet a blanket I get to keep” on my 33 before 33 list, actually). I bookmarked pattern after pattern, and none of them felt good enough for my first baby, somehow. But I kept coming back to this pattern, and knew it would be a way to add lots of bright colors in a non-circusy way. Ben hasn’t needed it yet, but I’m hoping he’ll love it some day. 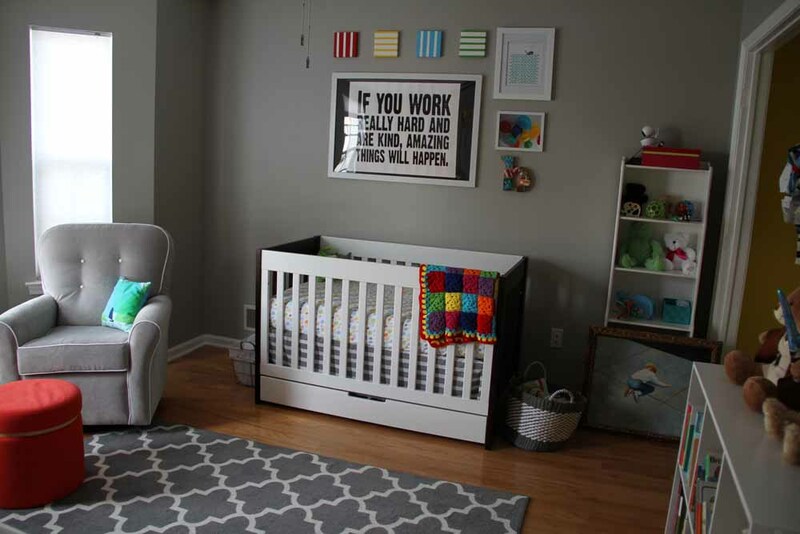 Putting Ben’s room together was really fun, and now that we spend so much time in there with him, it feels so perfect… not just because it feels complete, but because all the color is cheerful, and the gray and white are calming. It came together better than I could have pictured, and that makes me pretty damn happy. With just under a year and a half of Project Life under my belt, it wasn’t even a question that I’d keep it going in 2014. I’m sure, like every thing else, I’ll have to reimagine how I approach it once this baby arrives, but for now, full steam ahead. 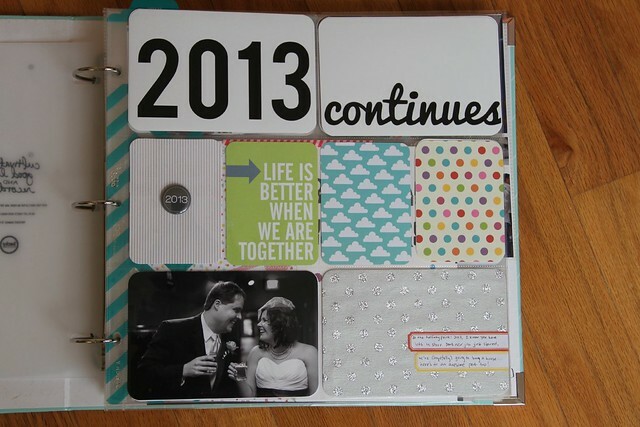 I haven’t changed much about my approach for 2014, other than adding some new supplies. 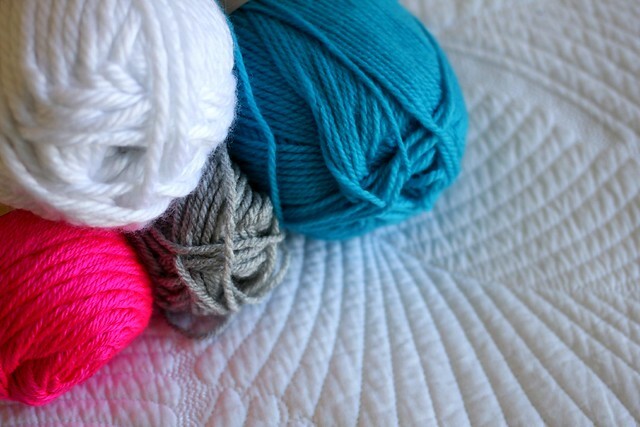 I’m now subscribing to the Studio Calico Project Life monthly kit, and definitely enjoyed my January kit. (Especially since I’m not normally much of an embellisher; having embellishments that not only coordinate with cards but are fun/cute has been an interesting adventure so far.) I now have three core kits: Seafoam, Honey, and Midnight. I’m especially obsessed with Midnight, which I’ve only been using since this year began, and am loving the simple, clean lines. I also bought Ali Edwards’s weekly title card overlays. Last year, I just used Photoshop to add text with the week number to a photo, but I’m loving how these overlays look so far this year. I wanted to go simple but bold with this year’s title page, and I was super inspired by the triangles featured in both Elise Blaha’s 2014 title page and Trish Harrison’s 2014 title page. I probably could have used a template, but instead I created this in Photoshop myself, painstakingly dragging black rectangles around the canvas, erasing corners of my photo… even though it took over an hour and I nearly went cross-eyed in accomplishing it (self taught isn’t always the best way…), I just love how it turned out. Stripes, black and white, me being weird and Dan being awesome. It’s perfect. Lots of black, white and yellow this week – so the Midnight kit was perfect alongside the black and white cards from the Studio Calico kit. This was an instance in which I ended up converting the photos to black and white so they’d look nicer together. It was all over the place before I did that, for sure. Week three was another simple week. Sometimes I look at pages like this, with so many of the “filler” cards, and feel like I phoned it in, but there’s really a ton of journaling in this week’s spread, so it’s just a matter of adjusting my thinking to be able to include some stuff just because it’s pretty. Week four included our one year anniversary. We celebrated in a few different ways over a few days, so I included two inserts: one with photos from our celebrations (and some confetti) and one for our cards. This week also includes a photo that illustrates how my approach to Project Life is so inherently different than how I used to approach daily photo projects – the blurry, not “cute” photo of Luna on the right hand side with her neon green shoelace is simply not what I’d ever consider a “good” photo or one worth posting on flickr or instagram at ALL. But I didn’t hesitate to print it for my album, because someday she won’t be so small and so crazy, dragging her green shoelace up the stairs and onto our bed to roll around with and play. Green is another color that I rarely gravitate toward, but it pulled the photos together in a way that I really loved, and I had so many green cards that worked so nicely. 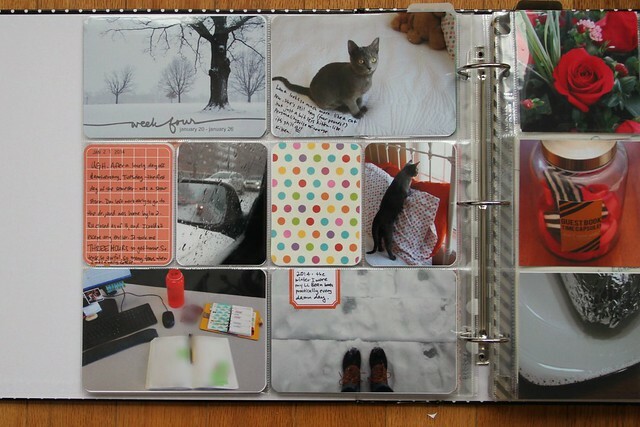 I haven’t posted about Project Life in a while, which is not to say that I abandoned the project. In reality, I was keeping up pretty steadily, right up until I packed up my craft room before we moved back in September. And then between unpacking a whole house, finding out I’m pregnant, being tired all the time, waiting for my new furniture… I didn’t touch it until almost halfway through December. I had a LOT of catching up to do. Anyway! 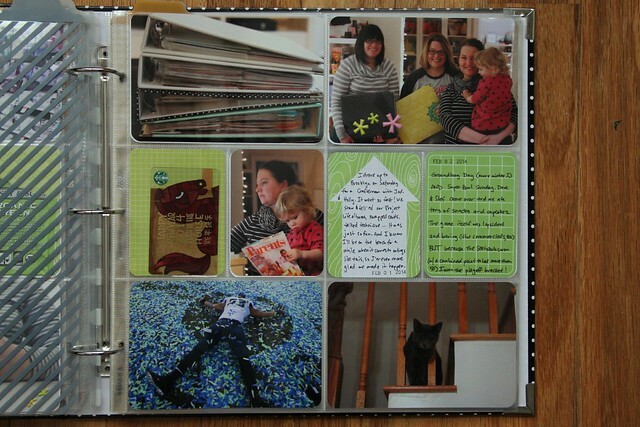 With a few afternoons of happy crafting (dodging a curious kitten) in December, I finished up my 2013 album. I’m not going to post all of my pages here, because honestly. So I am posting my favorite pages, instead. 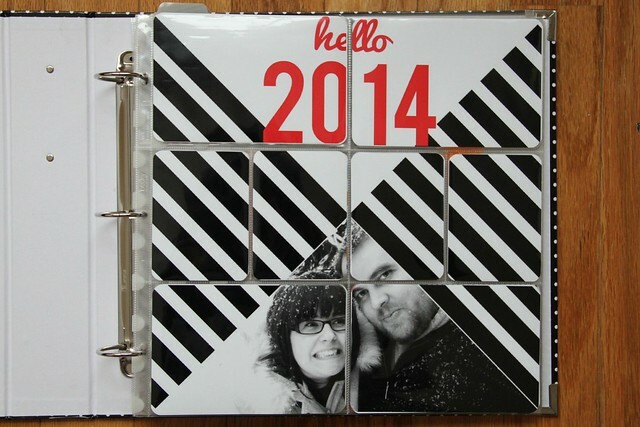 I’m absolutely continuing this project in 2014, and I can’t wait to get started. 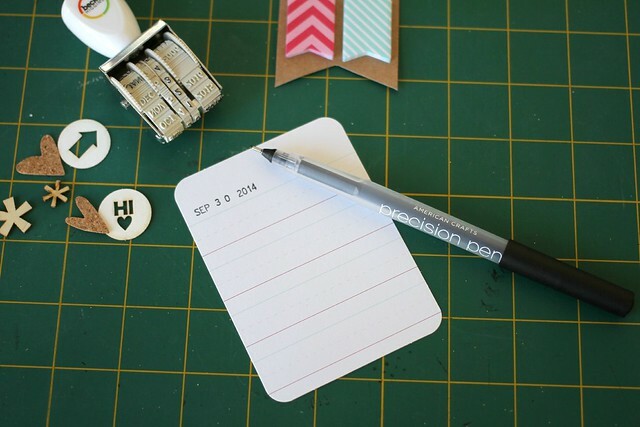 I have wanted to write a bit about how Project Life has been working out for me this year, since I really love reading about how others approach the project. 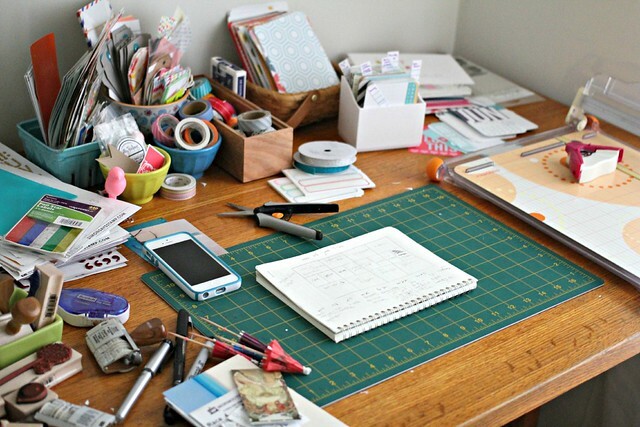 I also LOVE seeing pictures of your craft desk/corner/area. 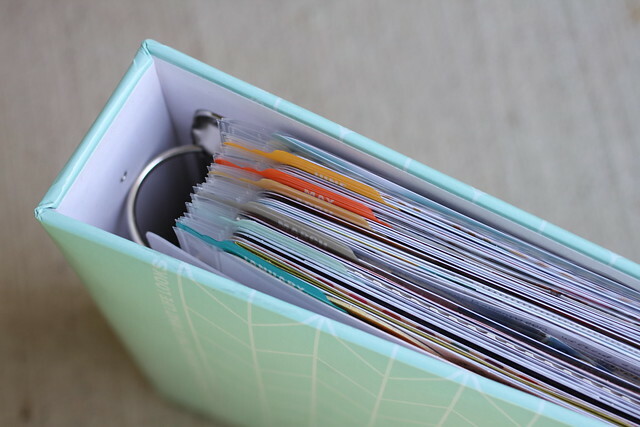 And truly, I think Project Life is so accessible, so I feel like writing about how I approach it might help someone out there realize that they could TOTALLY do this, too. The irony of the timing of this post isn’t lost on me, as I’m here posting photos of my craft space only after it’s all packed away ahead of our move this week. I don’t know how I’ll set up my craft space in the new house, but I know that this set up worked really well for me so I’m sharing it here anyway. I finished my first album with week 26, so it includes January – June. It seems that some people can get an entire year in one album, and others split the year into two (or even three!) albums. I squeezed 7 months into one album in 2012, which was probably just a bit much. Here is the end page of my first album for 2013. 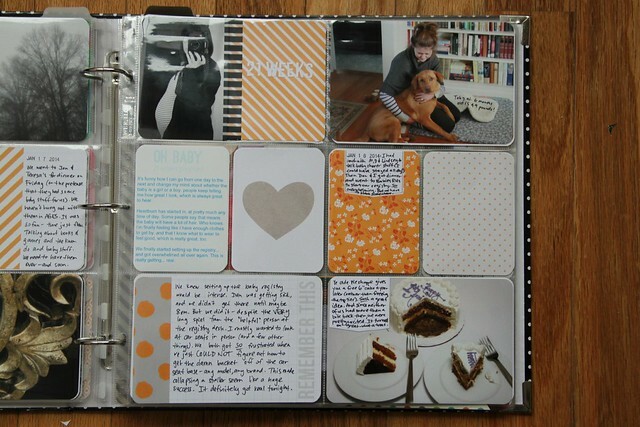 I posted a photo of my first page in this post. I’m trying to keep the style simple, with black and white photos, some of the same patterns from the title page, and some notes about the year so far. It’s funny to read that starting post again, because I definitely haven’t been using more “real camera” photos. Most weeks are primarily iPhone photos, and I’m okay with that, really. 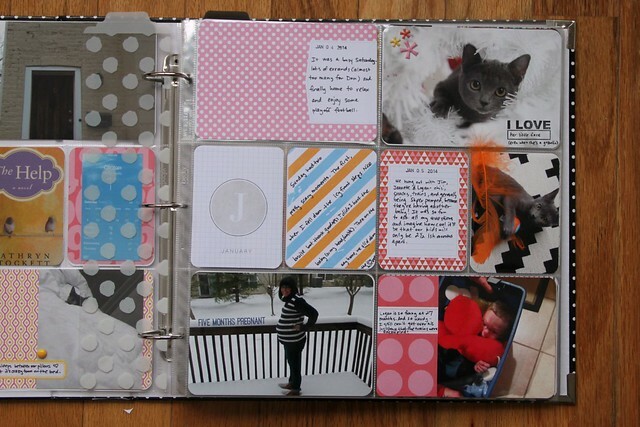 I still use the calendar cards and “this week” journaling cards, but sometimes I remove them if I have more content, or want to use that slot for something else. I’m trying to relax my self-imposed rules for the project by a lot, which goes a long way toward making it more accomplish-able. So how do I approach putting my pages together? I have been using the same basic method for a long time now. 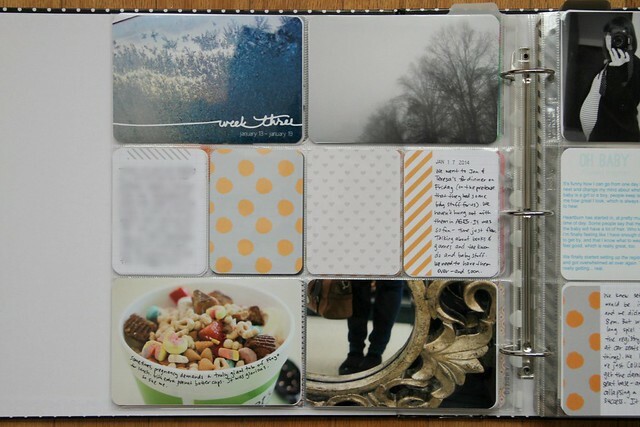 I have a small 6×8 spiral notebook that keeps everything together. 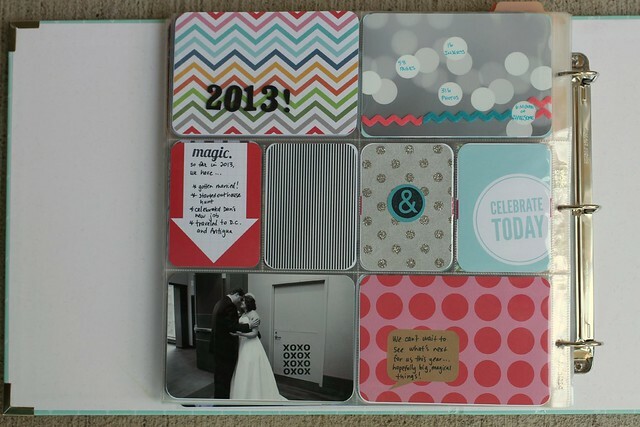 It actually started with what I thought of as my “wedding planning” notebook, and has expanded to be the notebook where I plan PL pages, write important to do lists… everything I don’t want to forget. It’s easy to toss in my bag if I want to work on the week’s plan at lunch, and doesn’t take up too much desk real estate when I’m building the pages itself. Each week, I draw out the spread, and put the week number and dates at the top and bottom of the page. I use pen for the framework – and then pencil for everything else. I tend to move things around and change my mind as the week goes on. I use the mini calendar at the bottom for a quick summary of what happened each day, as I’m always surprised how quickly I forget what happened each day. I use the margins to include a list of the photos I’ve taken so far, and to help determine if I need an insert to accommodate extra photos, etc. There are some weeks where I put the pages together very quickly, but every week, without fail, I fill out my pencil plan during the actual week. 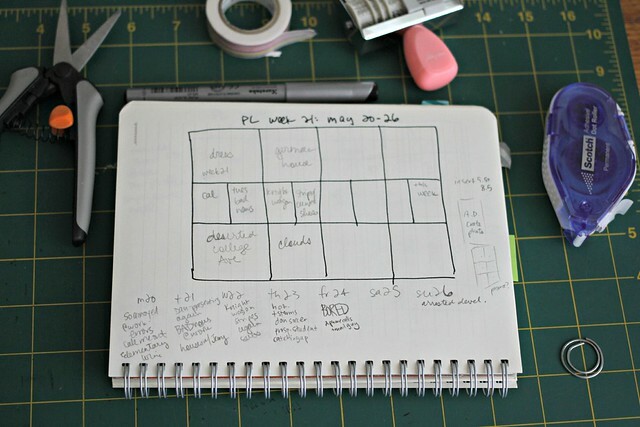 This makes it SO much easier to build pages even if I’m doing it several weeks (or a month!) later. Seriously, if you take one thing from this: it’s that planning out pages as the weeks happen is HUGE. Building the pages themselves happens in two stages: 1. Editing/cropping photos, creating any text files, and printing everything on my printer at home, and then 2. 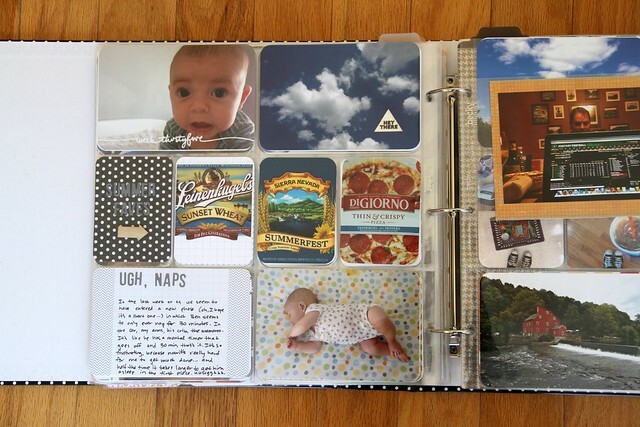 Actually filling the page protectors. Sometimes I print the photos that week or the week after, and don’t make the page until 3 weeks later, and sometimes I print them much later. It depends on a lot of things – whether I have an evening to myself while Dan’s gaming or staying late at work, how lazy I feel, how much else is going on, etc. My desk often looks like this. Even after I organize it nicely, this is mostly how things end up. 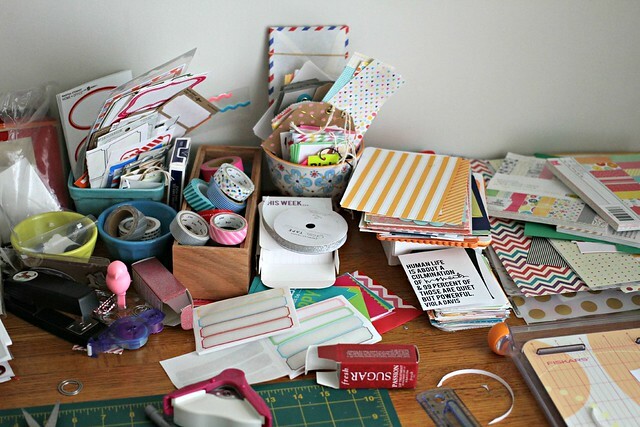 I have the piles organized by size or category (the pile to the left is all letter stickers, for example). It sort of makes sense as I’m working, but I often forget about supplies that I don’t use much. 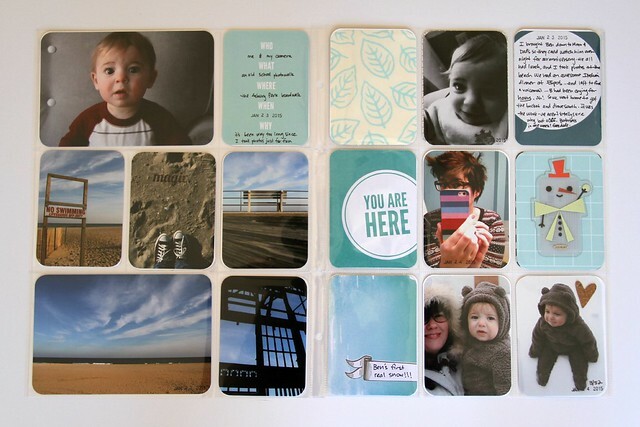 Once I bought the second core kit (I now have Honey and Seafoam), I bought little bins for 3×4 and 4×6 cards. I pulled out one or two of each design so they’re handy, since flipping through the entire box wasn’t working very well. I’m very tempted to get one of these Things Bins from fab to replace all of my various mugs, bins, and bowls… even though I love them (and the excuse to buy more mugs/bowls/bins). 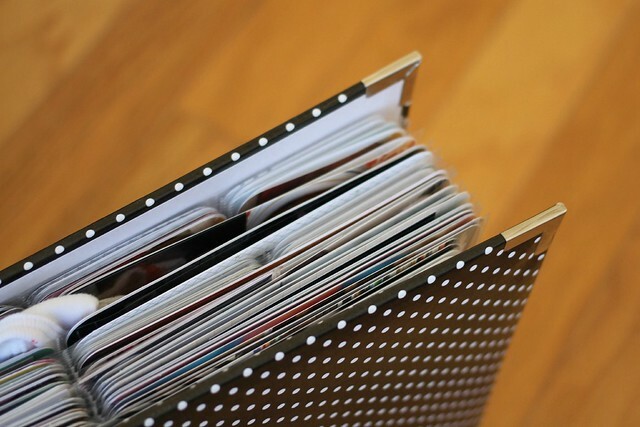 And this is my super-fancy solution to where to keep my album as I’m filling pages. We had piles of wedding gifts in my craft room (because our apartment has been packed to the GILLS, and we’re saving many of these for the new house, to help the new house feel even more fun, rather than have to re-pack everything now), and I made a nice little shelf out of boxes. I keep the open album on the pseudo shelf, which is right behind me when I’m sitting at my desk. In my new space I would LOVE a corner desk, but I’m not sure it’ll work out that way. So that’s how it works. I have gotten pretty seriously behind a few times this year, and surely will with our move to the new house this week, and that little spiral notebook has made it possible to catch back up pretty quickly. 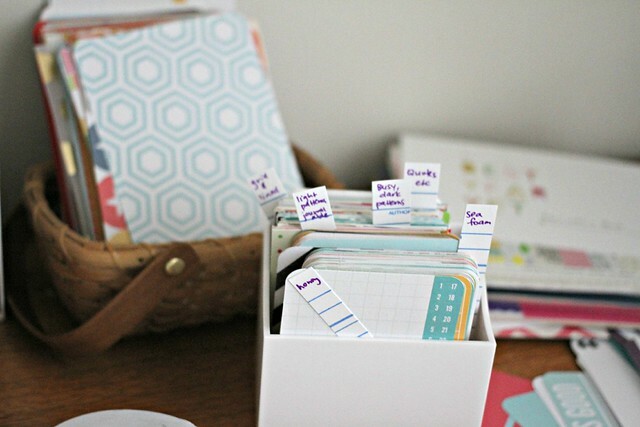 I’m always looking for more ways to stay organized, that’s for sure. 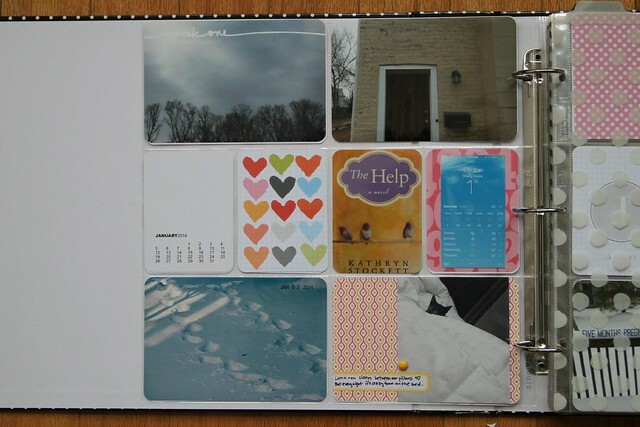 I’ll probably also sign up for Catherine Davis’s Process workshop at Big Picture, just because I can’t get enough of anything process- and organization-related.